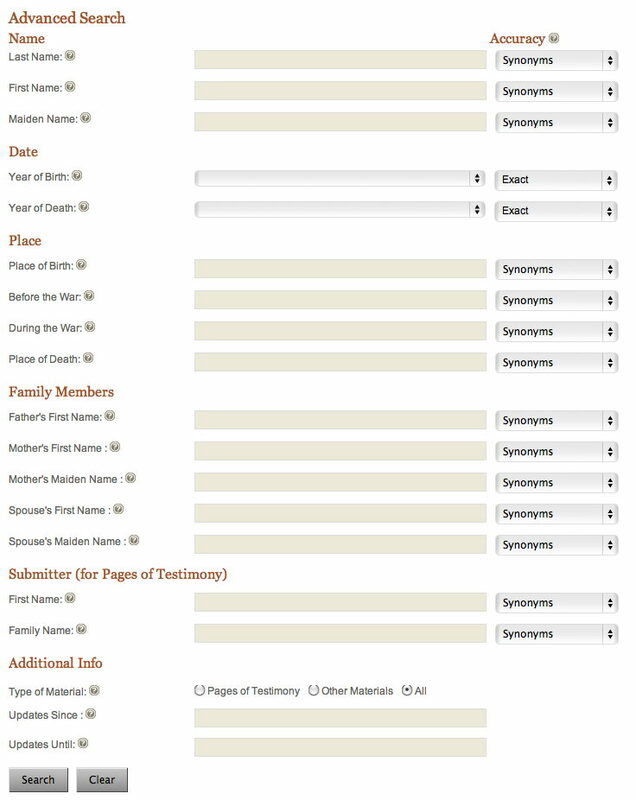 "The online Names Database creates a link not only with the dead but also among the living, within the Jewish people," said Nobel Laureate Prof. Elie Wiesel after filling out a Page of Testimony for his father, Shlomo. "It strengthens the connections between families, between cities, between communities. Furthermore, it brings a heightened awareness and a deepened sense of remembrance." Yad Vashem is the Israeli Holocaust Memorial and its name derives from the Biblical verse, Isaiah 56:5: "and to them will I give in my house and within my walls a memorial and a name that shall not be cut off." Yad Vashem means: a memorial and a name. Their database of names was initially put online in 2004, and has grown since then. It's easy to search. The basic search function has three input fields. 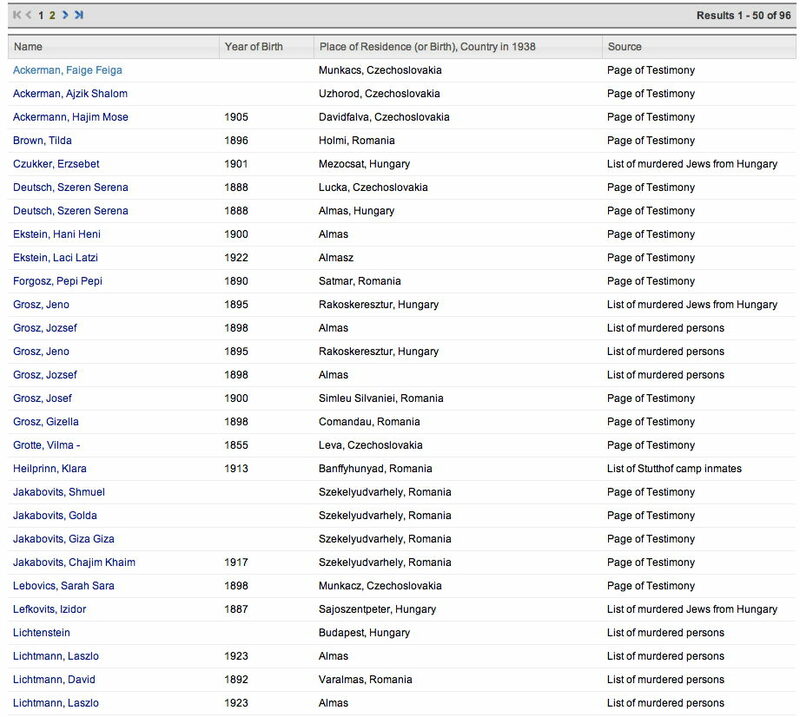 You can enter data in only one, or all of the fields, though the search results will only provide the first 1000 records, so searching by first name alone is likely only useful for unusual first names. For Year of Birth, or Year of Death, you have an option of +-2 or +-5. 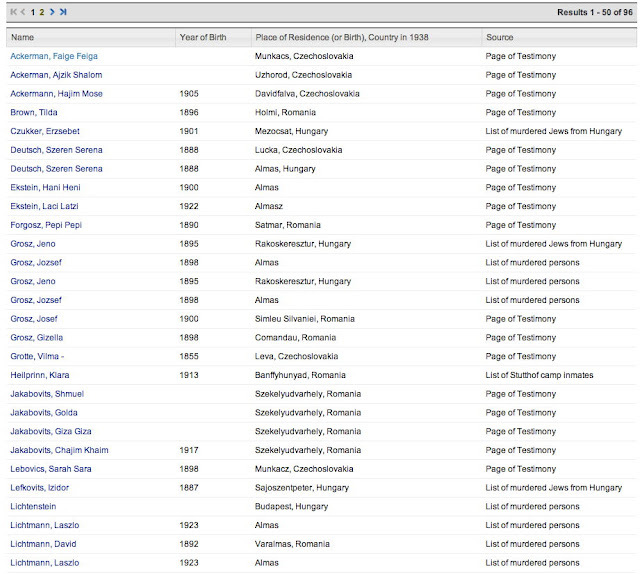 Here's what the results page looks like if you search for every individual born in Almasu. (The town where my maternal grandfather was born.) I didn't specify a country, as it varied depending upon the year. If I specified Romania or Hungary, I'd only get about half the results. However, the synonyms option yields many variations of the town name (Almasu, Almas, Almasz, Nagyalmas, Varalmas). For those entries below with a different town, the other town was their residence in 1938. The actual record indicates Almasu as their place of birth. Helen had a half-brother named David, and all the information I have on his birth was "After 1882" as I knew Helen was the oldest. Helen was born in a different Transylvanian town (Margitta), but they're not too far apart. I thought all the Lichtmann children were born in Margitta, but since David was in his 40s by the time of his death, birth place and residence prior to the war could have been confused. The information on the David Lichtman in the database, unfortunately, doesn't include parents. Note: Clicking on the magnifying glass image searches by that input field, and clicking on the green image shows you the location on the map. The links above work, however, the search for all those born in Varalmas, Cluj, Transylvania, Romania yields only 4 results, as it searches for no synonyms. This could be my great grandmother's half-brother, or someone else with the same name. There's no way for me to be certain yet. There are two pages of testimony for Serena Deutsch, which appear to have been submitted by two different daughters. Scanned images of the testimony are viewable, though the documents are in Hebrew. Szeren appears to have been the daughter of Simon and Betti Tantzos, and she married Mor Deutsch. I do not know if or how Mor was related to my great grandfather, Samuel Deutsch. 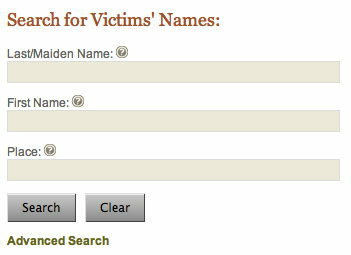 I searched for several other family names at the website, and will share some of the results in future posts.